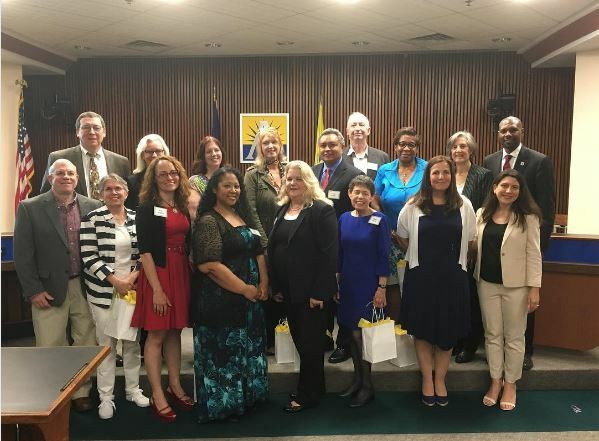 The Arlington School Board is now accepting nominations for the 2019 Honored Citizens! One of the APS Strategic Plan goals is to “develop and support strong connections among schools, families, and the community to broaden opportunities for student learning, development, and growth.” We are fortunate that many community members support this goal by donating their time to help our students receive the best education possible. These dedicated volunteers contribute in many capacities throughout our schools, from serving as a member or officer in a PTA, to participating on an advisory group, to reading to students. Many volunteers return year after year, and their contributions are greatly appreciated. The 2018 Honored Citizens are pictured above. In 1975, the Arlington School Board established the Honored Citizen Award to recognize volunteers who have made extraordinary contributions to our schools. Honored Citizens have demonstrated a sustained commitment of at least five years to Arlington Public Schools. These dedicated individuals have donated significant time and energy to a broad range of volunteer activities throughout the school community. Each year the School Board celebrates these outstanding community members with a reception and a recognition ceremony. This year the ceremony will be as part of a Board meeting on Thursday, May 23, 2019 in the School Board Room, Syphax Education Center 2nd floor, 2110 Washington Blvd., Arlington, VA 22204. Nominations are now being accepted for the 2019 Honored Citizens award. The School Board welcomes nominations from all members of the community. If you know of someone who meets the criteria of Honored Citizen, please consider nominating them for this award. Please remember, though, employees of Arlington Public Schools, previous honorees, and candidates for public office are ineligible. To submit a nomination please fill in the 2019 Honored Citizen Nomination Form below, or click here for a pdf version of the 2019 Honored Citizens Nomination Form . To request the form as a Word Document, please email school.board@apsva.us. Nominations are due by close of business on FRIDAY, April 12, 2019. If you have any questions, please contact the School Board Office at school.board@apsva.us or 703-228-6015. Please fill out the nomination form below. If you wish to submit supporting documents, please email them to School.Board@apsva.us with the heading "Honored Citizen Nomination" and your nominee's name. Please be as specific as possible. For example, include titles, committees, activities, accomplishments, contributions and length of service. Please remember, a commitment of 5 or more years of service is required to qualify for Honored Citizen. Please attach up to 5 supporting documents you would like to submit with your nomination. Allowed file extensions - pdf jpg gif.